MARKET STALL APPLICATIONS FOR 2018 ARE NOW CLOSED. THANK YOU TO ALL WHO APPLIED - ONLY SUCCESSFUL APPLICANTS WILL BE CONTACTED. Please note that due to limited capacity on site, there is a high demand for market places and we may not be able to accommodate all applicants. The trading dates for the 2018 event will be 15 November to 1 November. The entertainment program will commence on Thursday afternoon and will come to a close (officially) on the following Sunday evening; however trading will continue until Monday 12pm. This provides scope for over 100 hours of active trading while the festival program is in operation. All stallholders must be aware of the following before applying. Stallholders must arrive on site and be in your stall placement allocated by no later than 8pm on Wednesday 14 November. Arrivals on Wednesday may only be within the hours of 9am-8pm and you must notify the Market Manager of your arrival time in advance of the festival to ensure that you can be bumped in smoothly. No entry will be permitted outside this time. Access to the Bazaar area will be closed by Wednesday evening. If you do not arrive on Wednesday by 8pm you may not be able to access your designated stall spot. If you have arranged a powered space, electricity, will be available from Thursday afternoon until Monday morning. Road access to the Bazaar area will not open until Monday at 10am - stallholders will be permitted to vacate stall placements after 10am when the Market Manager says it is safe to do so. All market stall rates include two tickets to the festival. Each stall is entitled to purchase additional tickets at discounted rates - the limit for Retail Stalls is 2 additional tickets and for Food Stalls the limit is 6 additional tickets. These additional tickets are generously priced at $150.00 – half the price of entry to the festival. You must specify the exact amount of additional tickets required in your application. Please note that in prior years we allowed stallholders to purchase an unlimited amount of tickets, and unfortunately this privilege has been abused, causing us to implement a new policy going forward. A variety of stall sizes are available at the rates listed below. The spaces described include allocation for very limited camping/car parking behind your stall. If your stall application is accepted, you will be provided with an allocated place in the Bazaar site plan. All stall spaces are pre-allocated during the site design phase. Please respect our placement decisions, we take as much time and care as we are able to give the Bazaar a clean and fair layout for all involved. Please do not set up your stall without seeing the Markets Manager first. We cannot guarantee that there will be the ability to have your car behind your stall or camp behind it, so please do not take this as a given. Strawberry Fields is committed to reducing its environmental impact. Please be mindful of all single use products, and please note that single use plastic bags and single use plastic bottles are 100% banned! This means you cannot sell drinks in single use plastic bottles. We appreciate your help in keeping our festival single use plastic free! All stallholders are responsible for the proper disposal of all waste generated by their stalls. A range of bins will be available on site and stallholders will be expected to use these bins and not the wheelie bins placed around the festival area as these are for general patron use. Please note that we do not accept applications from vendors wishing to sell any form of alcohol or tobacco. As stated in the environment policy section the sale of single use plastic bottles is not permitted. We have a rate based on frontage size, if you have something outside this range please contact us to discuss more. Please consider the size of your required stall space very carefully! The dimensions referred to below are for your stall frontage only. Each stall may extend to a maximum depth of 8 metres. Limited space will be available behind each stall for car parking and camping, and will be allocated on a first in best dressed basis. The above prices include 50 amps of power only. Extra outlets may be purchased at an additional cost. In order for your application to be accepted you must provide a current certificate of public liability insurance that covers the dates of the 2018 event and all activities which will be undertaken by your stall. It is the responsibility of all food vendors to ensure compliance with the relevant Council authority in regards to obtaining health & safety and/or food vending permits. We will provide as much information as possible in order to assist you with this process. Obtaining such permits may require the vendor to hold current food handling certificate, registration of a food premises, and other practices in place to guarantee compliance with health and safety practices. Serving food without complying with Council regulations is a breach of the law, and any vendor identified by the event organisers to be causing such a breach will be requested to cease trading immediately and be ejected from the property if necessary. All food vendors operating fuel burners must comply with safe fuel storage practices. You must detail all measures that will be adopted by your stall to safely store and manage the risk around fuel in your food stall application. We are committed to sustainable waste management – ALL food vendors must submit details of their sustainability plan to the Market Manager, including planned disposable cutlery/crockery, recycling and waste management. We have maintained a rate based on frontage size, if you have something outside this range please contact us to discuss more. Please consider the size of your required stall space very carefully! The dimensions referred to below are for your stall frontage only. Each stall may extend to a maximum depth of 8 metres. Limited space will be available behind each stall for car parking and camping, and will be allocated on a first in best dressed basis. 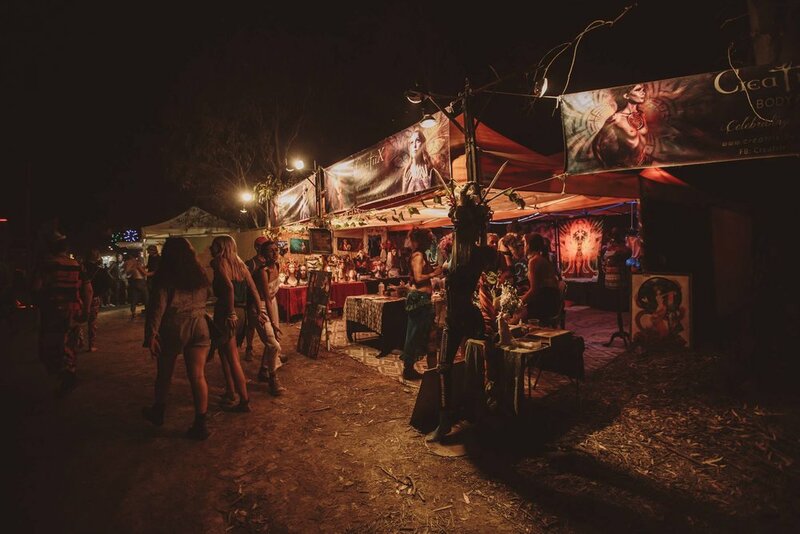 All stall spaces are pre-allocated during the site design phase, and if you arrive at the festival with a bigger stall expecting more camping and car space than you have applied for you are in for a nasty surprise!!! Accurate dimensions must be included in your application.